February 2006-U.S. Federation for Middle East Peace (“USFMEP”) hosted a panel discussion on “Human Trafficking in the 21st Century” as part of the Commission on the Status of Women (CSW) 50th session with H.E. Mr. Jan Eliasson, President of the sixtieth session of the United Nations General Assembly. UFMEP President, Mrs. Salwa Kader, moderated the event discussion, which shed light on the atrocious impacts of human trafficking, particularly on women and children, in contemporary global society. February 2006 - U.S. Federation for Middle East (“USFMEP”) President, Mrs. Salwa Kader, hosted a panel discussion on “Muslim and Arab Women Speak Out” as part of the 50th session on the Commission on the Status of Women (“CSW”) at the United Nations Headquarters in New York city. The panel focused on the misconceptions and generalized views held by the West towards Muslim and Arab women. The panelists strived to show that Muslim and Arab women are not simply silent victims of oppression, as commonly perceived, but are rather active and involved members of society with dynamic views and perspectives. 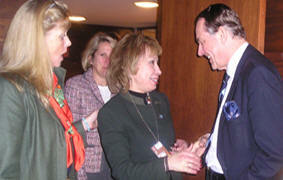 February 2006 - U.S. Federation for Middle East (“USFMEP”) hosted an event titled “Widows in Islam” as part of the 50th session of the Commission on the Status of Women (“CSW”). USFMEP President, Mrs. Salwa Kader, moderated the event discussion. The panel focused on the variety of adversities widows face in Muslim countries and further explored their rights under Islamic jurisprudence.